It seems we're loosing way too many pets to cancer these days. But even with these grim statistics there's hope. Cancer is not a death sentence -- amazing advances in treatments can provide some pets with high quality of life for years to come. So when we heard about the Give Cancer the Paw Blog Hop, which kicks off today, we wanted to participate to help share some of the information we gathered from our cancer experience, and how you can help. Just last weekend we participated in the Puppy Up! 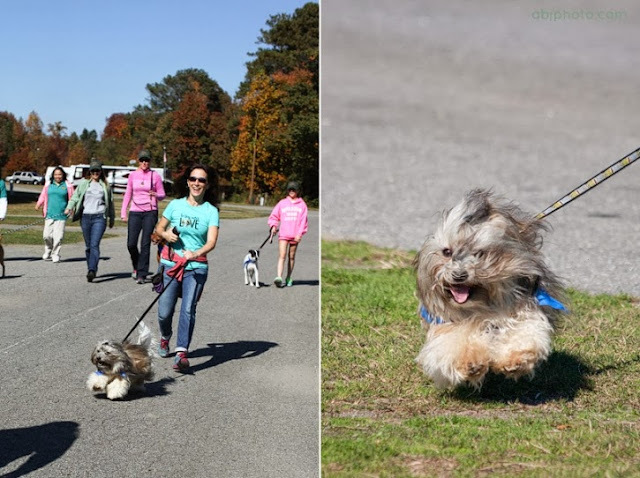 Atlanta walk to help raise funds and awareness for cancer research through the 2 Million Dogs organization. You can learn more about it and look for a walk in your area here. Many of this year's walks have already taken place, but you can keep them on your radar for next year or start up a walk in your area. We had a terrific time walking in the Puppy Up! walk with Rocco... who always has a terrific time! This November, PetCareRx is teaming up with the National Canine Cancer Foundation to spread the word about National Pet Cancer Awareness Month. You can join in the effort to raise $5,000 for the NCCF. For every "like" on the PetCareRX Facebook page, they'll donate 50 cents to the foundation. Today, Zuke's announced a new social media campaign titled "Fuel the Love to Fuel the Cure"to help support The Dog and Cat Cancer Fund (DCCFund), a non-profit organization dedicated to understanding, treating and preventing canine and feline cancer. This campaign will invite and inspire Zuke’s fans to share photos and videos of their dogs in action and loving life. For every person who follows @ZukesPets on Instagram or Twitter and tags their action-packed photo or video with #FuelTheLove, Zuke’s will donate $5 to The Dog and Cat Cancer Fund up to $10,000. We're joining the first Give Cancer the Paw Blog Hop, co-hosted by Peggy's Pet Place and Pooches Smooches. Check out the blogs in the linky below for more helpful information about pet cancer. Those are some great resources. Rocco looks so adorable on his Puppy Up walk. We joined that once, and there was another walk for cancer support too. Great way to get fit and help a cause! Thanks for joining the hop. Great resources to point out for folks. Good for you guys for walking in Puppy Up! I'm hoping we can do a walk like that with Rita some day. That's so cool about Zukes. As I said on another post, we already loved Zukes around here, and that is one more big reason to love them! You shared some great info in this post Rocco, so useful for folks facing this. We've already posted some videos to Zuke's! We have lost too many furends this last year too. So very sad. I love all the fundraisers that are going on to help with this. My husband is always saying he wonders why it is that cancer seems so prevalent these days. When we lost our golden last summer to cancer, only two weeks before that one of his littermates who belonged to friends of ours had also died of cancer....only it was not the same kind in their cases. There are probably so many factors, that it's good research is being done. It's also great to know there is so much information and there are resources out there to help. Excellent post & very helpful resources. Since we lost my black lab brother Jake to cancer, this is a cause near and dear to our hearts. I bet Jake and Cosmo are playing together at Rainbow Bridge.